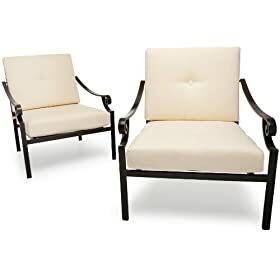 Durable yet surprisingly lightweight, this pair of cast aluminum deep lounge arm chairs coordinates with the Strathwood Falkner outdoor furniture collection. Ideal for use in outdoor furniture, cast aluminum is heavier and sturdier than standard aluminum but much lighter than cast iron. It's also quite resistant to chipping, fading, and rusting. It's constructed of wide, thin strips of black, powder-coated aluminum. The chair is marked by an open crisscross design on the back, and it features a slatted aluminum seat. The arms slope down and are highlighted by an artfully curled end. It measures 28 inches wide by 34.8 inches deep by 32.5 inches high and weighs 22.1 pounds. Each chair has a weight capacity of 250 pounds. No assembly is required. The set comes with thick, comfortably filled seat and back cushions--each with a center button accent--which are secured to the chair via fabric ties. They feature a durable, heavy Olefin canvas cover in a natural tone, and they offer a zippered closure that enables you to remove the polyurethane fill. Seat cushions measure 25.6 inches wide by 29.5 inches deep by 4 inches thick; back cushions measure 19.7 inches high by 25.6 inches wide by 4 inches thick.